A year ago I moved to Greenville, SC to live closer to family. I haven't looked back since, and I've fallen more and more in love with my new hometown every month. I had cursory knowledge of its great sights, food, culture, and climate before we moved, but the big surprise has been the city's vibrant tech community. A few months after moving, I discovered The Iron Yard, which at the time was running a three month startup accelerator. Peter and the crew were all very welcoming and invited me to hang out with the teams giving and receiving in turn... and of course occasionally talking Drupal. I wrote more about their program and space on my therapeutic moving blog, One Ville to Another. In recent months, The Iron Yard merged with this awesome co-working space (creatively ) named CoWork. They then scored a 30,000 sq ft office space ("the forge") in the heart of our wonderful downtown to gather not just their programs but also like minded design, development, and creative firms into a single space. They also launched a Coder Dojo to teach kids web development (along with Scratch game programming and Arduino hacking) and are now expanding the school to education for adults, too. Hence the blog post. Starting next month, The Iron Yard Academy will take a small class of folks through an intense, full-time, three month course in front end development. The two teacher-mentors will be Mason Stewart and Marco Suarez, a killer development / design pair who recently launched the attractive Etsy curation site Haberdash Fox. In addition to the course, students will get a MacBook Air, lodging in the city (if needed), access to The Iron Yard mentors, and guaranteed job placement (again, if needed) within a year doing front-end development in a startup - hopefully locally. The whole course is only $9,750 and will be repeated a couple more times this year if you can't make it so soon. The program is definitely open to students who already have experience in web development, even if you're currently employed. If you have an underutilized dev who wants to super charge their front end skills, I'd highly recommend sending them to learn and grow in this great community. 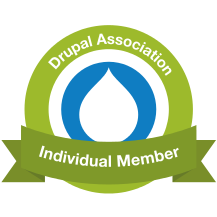 I look forward to meeting the new class, and I hope some of the new talent makes its way into the Drupal community. It didn't really fit in the post, but you should definitely go to Mason's website and check out his chiptunes. They provided the soundtrack for my writing. Not if you consider the cost of goods and prices for other training courses that reach $500+ per day. You'd pay $2.5k per week at those prices, but here you get twelve weeks. That said, if you don't need the lodging and already have an Air, I'm sure you can lower the cost. It may be a bit much for an independent student with no resources, but it's a steal when compared to other professional training courses. The guaranteed job placement and awesome mentors also make it an easier price to swallow, imo. Compared to? If you look at the other ways to learn code with an in person instructor this is actually very reasonable.